On April 24, 2017 the New Jersey town of Basking Ridge lost its oldest resident, the Basking Ridge historic white oak tree. 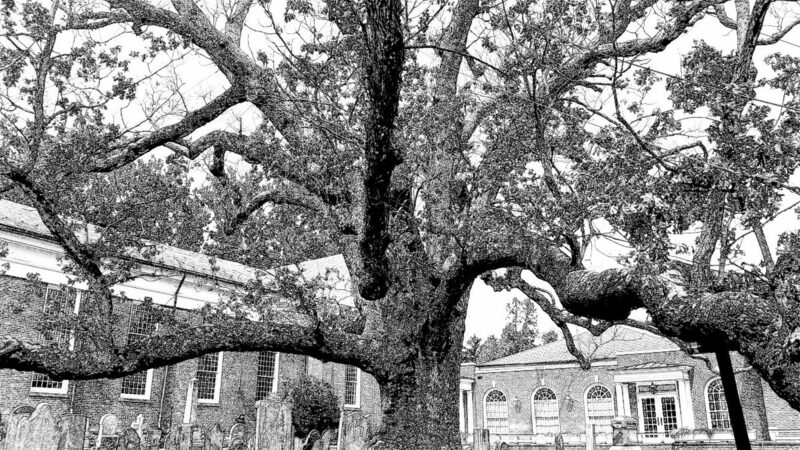 What was estimated to be over 600 years old, no one ever imagined that the tree would die during their lifetime and it came as quite a shock to the entire community. Are there other stories stories out there? 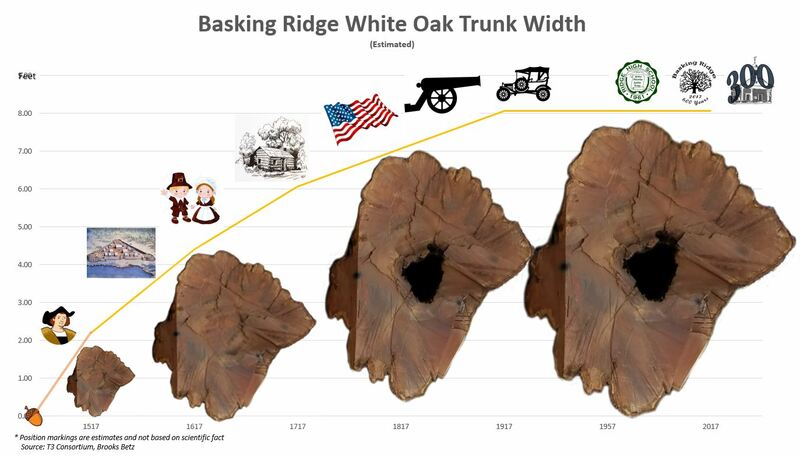 We started to think; how does the loss of the Basking Ridge Oak tree rank against the worlds oldest trees. Here’s what we found. 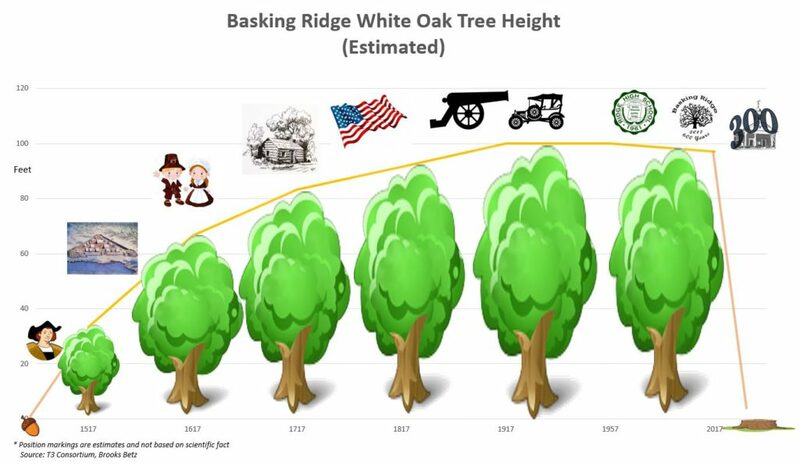 Basking Ridge White Oak Tree (Quercus alba) was known as the great white oak and is the pride of Basking Ridge, New Jersey. 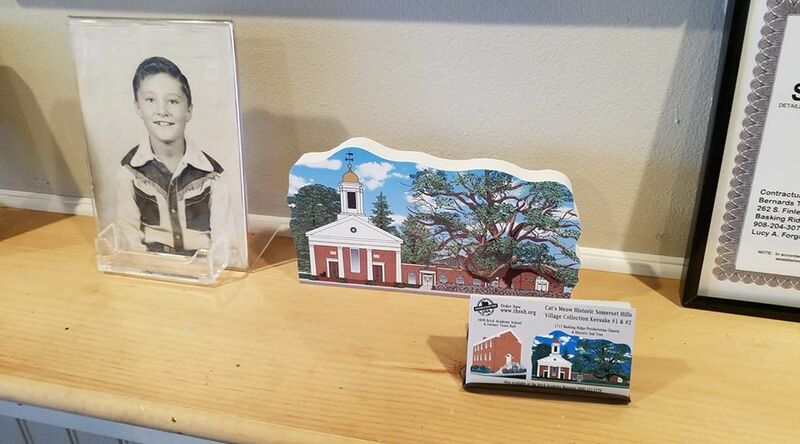 Situated right smack in the center of downtown Basking Ridge just to the right of the historic 1717 Basking Ridge Presbyterian Church sits the great white oak. 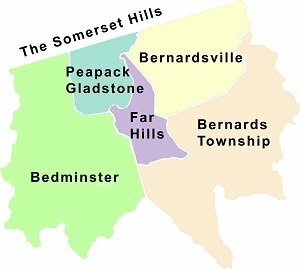 The tree is the essence of the history of Basking Ridge, a historic section of Bernards Township. The tree was cut down in April 2017. 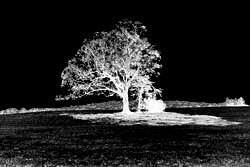 Typical white oak trees grow anywhere between 12″ to 24″ per year. the core rot was over 25″ wide, which could of been occurring for up to 300 years. 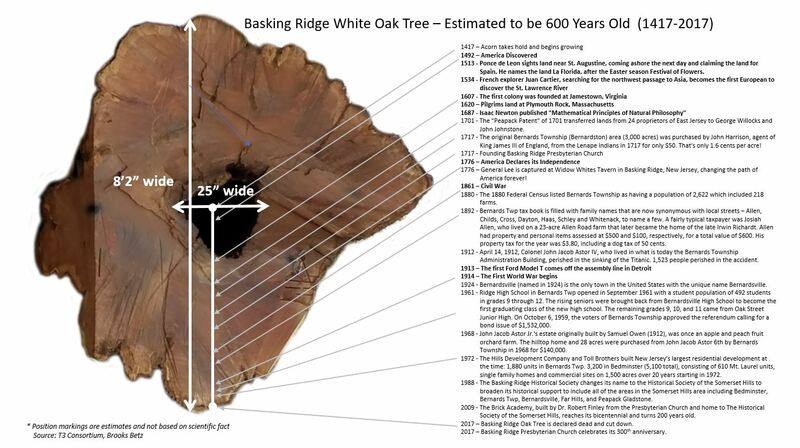 So you thought the Basking Ridge Oak tree was old, how about in Britain! Britain’s mightiest oak: A staggering 1,046 years old, it’s still going strong (even if it is getting a bit stout around the middle). Bowthorpe Oak in Manthorpe near Bourne, Lincolnshire, England is perhaps England’s oldest oak tree with an estimated age of over 1,000 years. The tree has a girth of 12.30 meters (40 feet 4 inches) – and astounding longevity. It can be found on Bowthorpe Park Farm. “High Park has as many as 60 ancient oaks, which is not surpassed by any other site I know, but more interestingly these trees could go back further than the middle ages as they were not planted and simply grew. At least 60 Middle Age oaks have been unearthed in a survey of the grounds of Blenheim Palace in Oxfordshire, with four of them measuring almost 30 feet in diameter. 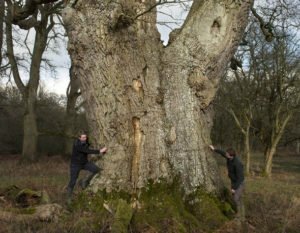 It was previously thought that Moccas Park, in Suffolk, Windsor Great Park, in Berkshire and Savernake Forest, Wiltshire, had the largest collection of the ancient trees, but the new research means Blenheim Palace has overtaken them. The Major Oak is a large English oak (Quercus robur) near the village of Edwinstowe in the midst of Sherwood Forest, Nottinghamshire, England. According to local folklore, it was Robin Hood‘s shelter where he and his merry men slept. It weighs an estimated 23 tons, has a girth of 33 feet (10 metres), a canopy of 92 feet (28 metres), and is about 800–1000 years old. In a 2002 survey, it was voted “Britain’s favourite tree”. The Major Oak may be several trees that fused together as saplings. England’s Perthshire’s Fortingall Yew, estimated to be around 5,000 years old making it older than Stonehenge. So what countries and what tree species are the title holders of “the oldest trees in the world?” It’s hard to believe that there is a tree that’s almost 5,000 years old and still growing! Read on! 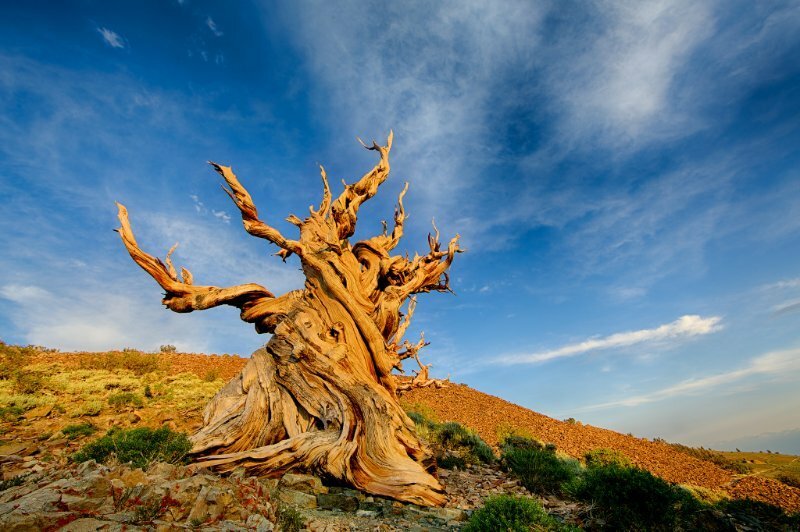 Methuselah – While Methuselah still stands as of 2016 at the ripe old age of 4,848 in the White Mountains of California, in Inyo National Forest, another bristlecone pine in the area was discovered to be over 5,000 years old. Methuselah and its unnamed senior pine’s exact locations are kept a close secret in order to protect them. Its age of around 4844–4845 years makes it the world’s oldest known living non-clonal organism. The ancient tree is named after Methuselah, a Biblical figure having the longest mentioned lifespan in the Bible of 969 years. Llangernyw Yew -This incredible yew resides in a small churchyard of St. Dygain’s Church in Llangernyw village, north Wales. About 4,000 years old, the Llangernyw Yew was planted sometime in the prehistoric Bronze Age — and it’s still growing! Patriarca da Floresta – This tree, an example of the species Cariniana legalis named Patriarca da Floresta in Brazil, is estimated to be over 2,000 years old, making it the oldest non-conifer in Brazil. The Senator -Though the Senator suffered tragedy in 2012 after a fire caused much of the tree to collapse, this iconic tree bears mentioning here. 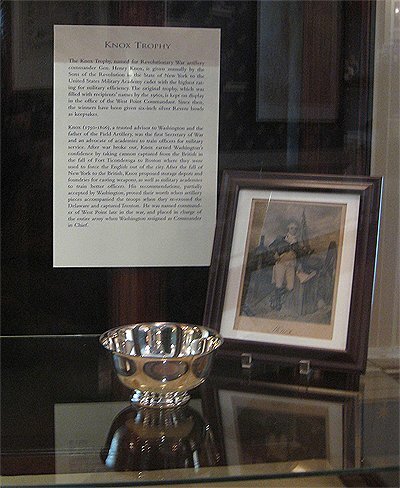 Formerly located in Florida, the Senator was the largest bald cypress tree in the United States, and was widely considered the oldest of its species known to exist. It was also likely the largest U.S. tree of any species east of the Mississippi River. Estimated to have been around 3,500 years old, the Senator was used as a landmark for the Seminole indians and other native tribes. Olive Tree of Vouves – This ancient olive tree is located on the Greek island of Crete and is one of seven olive trees in the Mediterranean believed to be at least 2,000 to 3,000 years old. Although its exact age cannot be verified, the Olive Tree of Vouves might be the oldest among them, estimated at over 3,000 years old. Jōmon Sugi – Jōmon Sugi, located in Yakushima, Japan, is the oldest and largest cryptomeria tree on the island, and is one of many reasons why the island was named a UNESCO World Heritage Site. The tree dates to at least 2,000 years old. Chestnut Tree of One Hundred Horses – This tree, located on Mount Etna in Sicily, is the largest and oldest known chestnut tree in the world. Believed to be between 2,000 and 4,000 years old, this tree’s age is particularly impressive because Mount Etna is one of the most active volcanoes in the world. The tree sits only 5 miles from Etna’s crater. General Sherman – Believed to be around 2,500 years old, General Sherman is the mightiest giant sequoia still standing. The volume of its trunk alone makes it the largest non-clonal tree by volume in the world, even though its largest branch broke off in 2006, smashing part of its enclosing fence and cratering the pavement of the surrounding walkway. Thanks to The Mother Nature Network for the great piece on the oldest trees in the world. See photos of the 10 oldest trees in the world – Click Here.